Holiday tradition continues at Theatre Nova with another fun-filled night from the same team that brought you The Year Without a Panto Claus and The Sugar Plum Panto! 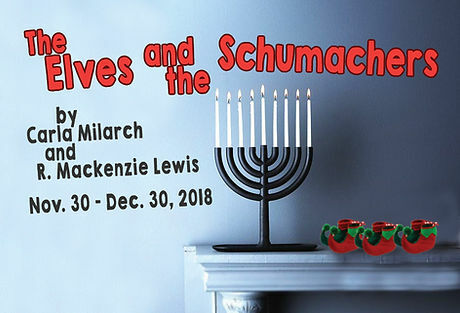 This year Hanukkah gets in on the act, when two toy-making elves on the lam wind up in a dreidel store, and hilarity ensues in this multi-cultural holiday celebration featuring musical comedy, slapstick, vaudeville, and fun. It is a family affair with laughs, boos, and hisses as well as sing-a-longs in this exciting, over-the -top night of heroes and villains, funny songs and extreme merriment! The Elves and the Schumachers features Elizabeth Jaffe, Dan Morrison, William Powers, and Sarah B. Stevens and is directed by Carla Milarch. The production and design team includes R. Mackenzie Lewis (music director/composer), Forrest Hejkal (scenic design), Haley Cook (costume design), Jeff Alder (lighting design), Becky Fox (props), and Alona Shewach (stage manager). Show runs November 30th through December 30th.